Square Enix and Capcom have a nice rapport going on with their crossover events for Monster Hunter: World and Final Fantasy XIV. Just last week the former welcomed a guest Behemoth boss battle into the fray, and as of today, XIV is getting a Rathalos trial. It's going to be a permanent fixture, but you'll probably want to get in on it sooner than later while everyone is going crazy for it. As is the case with pretty much every XIV event, this crossover is littered with all sorts of cute flavor text and animations that pay homage to Monster Hunter. 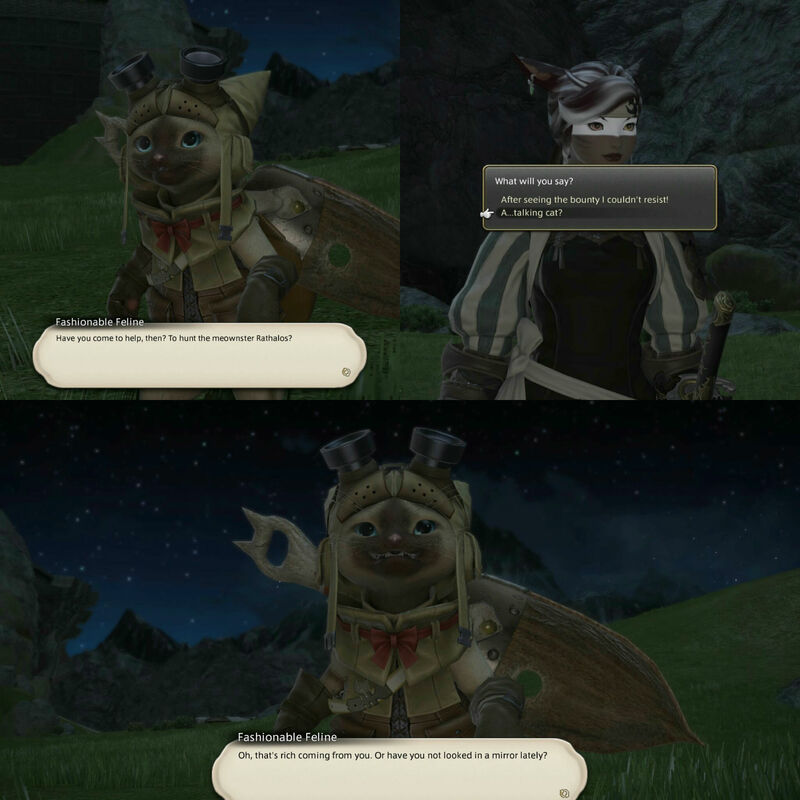 This interact with the feline Miqo'te race and the guest Palico NPC is particularly adorable (thanks Pixie)! Rathalos is not just an enjoyable battle by MMO standards, it's also a bit subversive in that during part of the fight you can only heal with special Monster Hunter potions (which are linked to the special item function that's new to Stormblood and typically used during quests). It also follows the MH principle of a lack of an aggro table, meaning the boss can attack anyone at any time -- a welcome mixup for people who are tired of the Holy Trinity formula. Having to actually "carve" the scales with a button press on the Rathalos corpse is probably going to piss off someone that misses them the first time around (the game does warn you), but like the aesthetics of the questline it's welcome. Oh, and it also ensures that you'll get most of the rewards eventually by adopting Monster Hunter's material system, and by proxy, the MMO token mechanic already present in XIV. For completing the normal version (which is more than manageable) you'll instantly net a Palico minion, an two BBQ spit tabletop furniture items (one outdoor, one indoor). You'll also get two scales for your trouble, which is where the real rewards are. Nominal amounts of scales (two to four) will net you Monster Hunter themed armor that's used for cosmetic purposes (it's level 1), with you can augment for "+" scales earned in the EX (hard) version. Additional BBQ spits and two musical tracks (which are used with the in-game Orchestrion jukebox) are 10 scales each. The really real rewards are the Poogle (pig) minion for five + scales, the "Proof of a Hero" song for another five, and the Rathalos mount for 50 + scales. There are a few provisos here, particularly for new players. This event is a massive undertaking if you're getting into the game just for it, as you'll need to complete the main story for the base Realm Reborn relaunch and two expansions (or boost to the latest one), then be properly geared for the encounter. EX will also require patience, time, skill, and of course, a competent group, as the difficulty is roughly raid-level. Another nice touch: just like Monster Hunter: World EX is limited to four players rather than the traditional eight. If you want to play the event yourself you'll need to have completed the Stormblood expansion storyline: then talk to the Hearty Hunter (at the coordinates 9.7/8.9) in Kugane. It's always going to be there, but it might not be as popular down the line so get in while the going is good and groups are plentiful.